This is a one day introductory sea kayaking course delivered at Cass Bay in Lyttelton Harbour. In this course we will introduce you to the wonderful world of sea kayaking. We will focus on paddling skills and rescues as well as how to use/maintain gear. This is a popular course for those who have limited sea kayaking experience and would like to get some professional guidance. This course is appropriate for people that have little or no experience and would just like to give it a go. This course is delivered in Christchurch. The meeting location is at Cass Bay in Lyttelton Harbour, Christchurch. “These guys put on amazing courses that never disappoint. The learn to lead course was fantastic, I learnt so much. Nathanael was a great teacher and super professional… Can’t wait to try out my new skills!” – Abbie Marie Wilson, Christchurch. 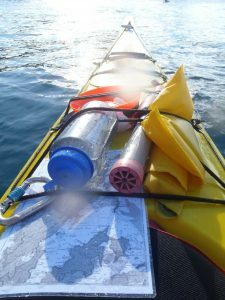 We provide all the necessary kayaking equipment including, sea kayak, paddle, pfd (personal flotation device), spray skirt, pump and paddle float. All you need to bring is a wetsuit and some spare clothes. We will email you a full gear list upon booking. We recommend holding off on purchasing any new sea kayak gear until after the course (except wetsuit). Why not buy new stuff? So you can optimise on your instructors knowledge and recommendations. (If you already own gear then please let us know).